Savio is present in the Oil & Gas sector with the production of specific fans in compliance with the standards of the sector. 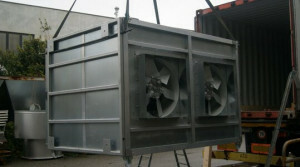 With particular reference to API standards and the specific requirements that each department demands, we are able to produce “purge fans” for the ventilation of refining furnaces, certified ATEX “exhaust fans” for the ventilation of process areas, high performance fans to supply combustion air for cracking and reforming processes. Industrial fans are used in industries oil gas, Hydraulic power Stations and Cooling pumps.